If you’ve seen photos that capture Southern Utah’s outstanding beauty before, then it seems inevitable that you’ll enjoy your stay without question. Regardless, it’s always useful to pick up some helpful advice and tips and tricks on the best accommodation to choose, exciting activities, local attractions, and to research recent maps of the area. Bryce Canyon National Park is one of the most truly magnificent sights the world has to offer and features a vast collection of giant natural amphitheaters formed by frost weathering and steam erosion. The red, orange and white colored rocks provide spectacular scenery for its many visitors to gaze at and adore, and each year the park sees over one and a half million people pass through it. Before deciding upon where to stay during your trip, have a good thorough look around and weigh up your options taking into account location and price. Consider staying somewhere comfortable and situated centrally so that you can access desired places in Bryce Canyon quickly and easily, and without the need for frequent taxi trips. If you’re keen to make your stay as off the grid and wild and free as you can, then think seriously to figure out what accommodation would be an ideal choice for you. Click here to book bed and breakfast near Bryce Canyon, and choose between enjoying your trip from a lodge or a cabin, for example. To engage in exhilarating hikes, consider taking the Mossy Cave trail, Rim trail, Bristlecone Loop, Queens Garden, Navajo Loop, or Tower Bridge trail. Alternatively, explore Fairyland Loop or Peekaboo Loop if you’re prepared for a strenuous climb. Many of these trails above intersect, so you can switch to combine paths if you want to step things up or down a gear. You can opt to take a guided tour through the canyon and from a list of guide services that provide an excellent range of outdoor fun. Some of your options include hiking, horseback riding, fly fishing, and ATV riding. Be sure not to bypass a visit to the Native American relics, known as the Escalante Indian ruins; the area is believed to have been inhabited by Kayenta and Fremont agricultural people up until around 1100 AD. 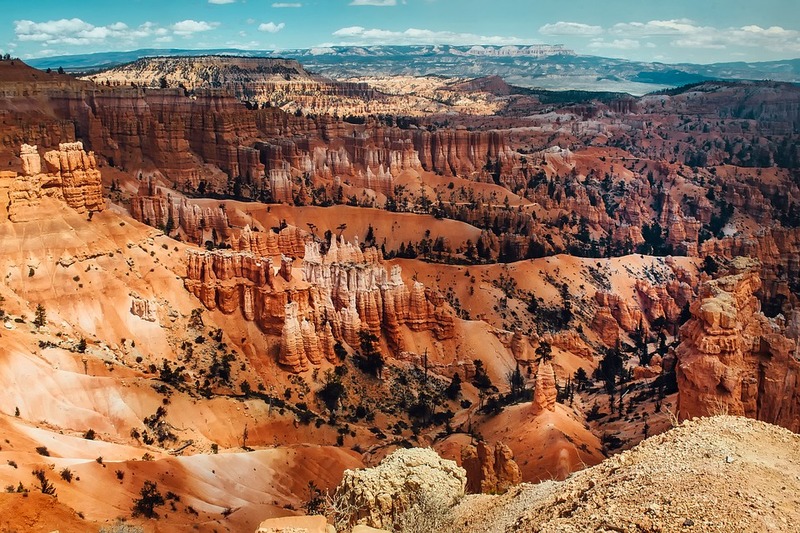 First and foremost, you’ll be at Bryce Canyon National Park to see the awe-inspiring views, and you won’t be disappointed. For the best sights, plan to set off on a hike around the canyon taking one of the eight marked and maintained hiking trails. All eight of these routes can be traversed in less than one day, so you’re in for a real sensory treat. The park is thought to have a 7.4 magnitude night sky, meaning that it has one of the darkest in North America, and making 7,500 stars visible to the naked eye in some of the places. With any luck, you’ll witness some of the canyon’s wild species that are listed under the Endangered Species Act: the California condor, the Utah prairie dog, and the southwestern willow flycatcher among other more common ones such as elk, mule deer, and cougars.